Composed of fruit from Carneros in the Napa Valley, this is a balanced, complex Chardonnay. The palate is expressive and rich with ripe notes of pear, apple and melon. The fruit retains a vibrant acidity that carries the palate into a lush finish of clean minerality and spicy oak. Brooding and purple in color, this is a rich, decadent and complex wine. The nose is bold and forward with raspberries, peaches and cream soda aromas. The palate is full but lively with additional red berry fruit, caramel, sweet vanilla and soft tannins that guide you into a lengthy, peppery finish. A deep ruby wine with bright fruity aromas of blackberry, cherry and violets. The palate is smooth and medium bodied with juicy black cherry and pomegranate flavors underscored by warm notes of black pepper, leather and toasted vanilla. This slightly effervescent wine is off-dry with notes of ripe strawberry, raspberry and sweet cherry. Enjoy this as an aperitif, with cheese or light entrees. This Garnacha from Northern Spain presents a nose of berry bramble, tobacco and leather. The palate is syrupy with rough tannins and flavors of baked blackberry, oak sawdust and creamy vanilla. Reserva Rioja must be aged a minimum of 3 years before release with one of those years spent in oak. This gives the wines firm but elegant structure and significant spice and vanilla notes. Intense, mature red fruit notes and hints of licorice round out the velvety palate. Each varietal in this Chilean field blend (Syrah, Malbec, Cabernet Franc and Petite Verdot) contributes something unique to the overall character. The Syrah provides peppery spice, dried violets and dark, damp earth while the Malbec brings bright red and purple berry notes. The Cabernet Franc adds cocoa flavors and round, smooth tannins with the Petite Verdot wrapping everything up in a lush, velvety texture. 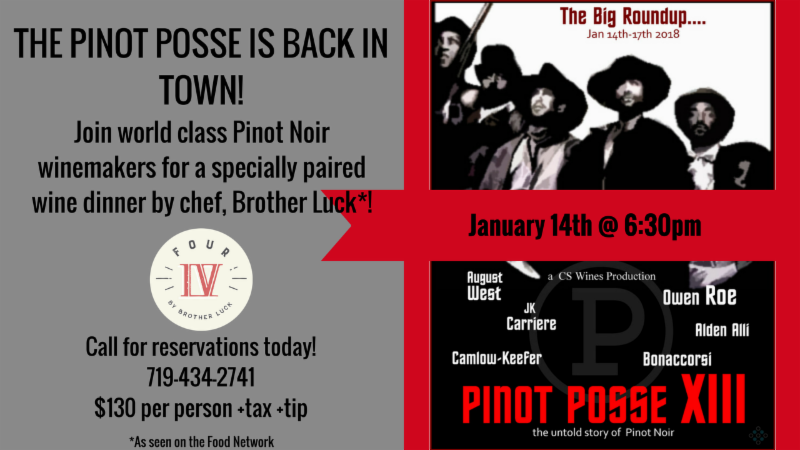 Every year we eagerly await the Pinot Posse wine dinner: where you get to rub elbows with the country’s premier Pinot Noir winemakers, all while enjoying a top tier, specially paired dinner. Named for the indigenous animal so at home on the slopes of the Andes, this is a vibrant cherry colored wine with violet accents. This is a fruit forward wine with ripe notes of cherries, blackberries and plums underscored by warm toasted oak notes. Full and soft with thick, round tannins this is a wine to warm you fireside this winter. A Zinfandel based blend from dry-farmed vineyards, this is a dark and intensely flavorful wine. It opens with a nose of baked blueberries, chocolate truffles and warm, exotic spices. The palate is soft and velvety with berry cobbler, toasted marshmallow and sweet vanilla flavors that linger into a long and appealingly fresh finish. This stellar Grenache is powerful yet restrained. It is an inky red in color and offers a classic nose of red fruit and dried lavender. The palate is more fruit forward than in typical in Old World wines and offers loads of jammy red fruit, violets and hints of spice. Lush and silky, this is a versatile wine for every occasion. This stellar value of a sparkling wine comes to us from the chalky soils of New Mexico. Opening with crisp notes of green apple and citrus, this wines offers a clean, mineral driven palate with lively bubbles and a touch of yeast on the finish. Definitely make this your holiday sparkler! This is a Merlot that shows both strength and restraint. The nose is rich and forward with notes of crushed blueberry, olives and sage. The palate is full and soft with thick, pliable tannins and intense flavors of blackberry, cherry and black pepper. This deep crimson colored wine opens with appealing aromas of blackberry cobbler, fig and tobacco. The palate is full-bodied and rich with flavors of black and purple fruit, bittersweet chocolate and dusty cedar. Velvety tannins and firm acidity support a long finish of vanilla and sweet molasses. This proprietary Napa blend is a fresh, vibrant and complex offering from acclaimed Shafer winery. A forward nose of ripe red and black berries, lavender and dried herbs ushers you into a bold and flavorful palate. Power and full-bodied, this wine offers abundant flavors of dried cherry, mocha, sandalwood and spiced vanilla. This is a wine made for rich holiday feasts and late night fireside conversations. Ideal vintage conditions and the use of dry farming practices have resulted in grapes with supreme flavor concentration. Undeniably opulent and complex, this Chardonnay offers notes of Meyer lemon, honeycomb and fennel. These rich flavors are balanced by a clean minerality and vibrant acidity leaving this wine fresh and easy to drink. You might not think of Italy when presented with a Cabernet Franc, but this is a wine that will change your mind. From Tuscany’s Maremma coast, this is classic Cabernet Franc at its best. A balance of dark fruit and brambly earth, this wine offers rich flavors of cherry, blackberry, espresso and forest floor bolstered by dusty tannins and finishing with a lingering smokey spice. A blend of Cabernet Sauvignon, Merlot, and Syrah, this wine has a bold nose aromas of lavender, licorice and blackberry. The palate is lush, but fresh with additional notes of juicy black fruits accented with flavors of tobacco, dried herbs and a spicy vanilla finish. Predominantly Cabernet Sauvignon with a bit of Cabernet Franc added in for freshness this is a voluminous and rich wine. Dusty notes of cassis and black cherry abound with dried sage developing midpalate. A lively texture and thick, but soft tannins ensure this is bold wine remains restrained and approachable. This Estate Chardonnay from Alexander Valley is aged 8 months; half in oak and half in stainless steel. This gives the benefit of depth and richness while still maintaining pure expression of the fruit. The palate is full and creamy with notes of caramelized citrus, brioche, apricot, white peach and honeysuckle. As the palate develops, there arises a core of bright acidity and chalky minerality that gives this wine balance and elegance. This Sangiovese based wine is a vibrant red color with a bouquet of red berries, dried violets and dusty earth. The palate is lively and acidic with tart cherry flavors, baking spice and fine, gritty tannins. As always, Chianti is an excellent and versatile food companion. A Bordeaux style blend from South Africa, this wine is complex and elegant with herbal and violet aromas. The palate is smooth and supple with ripe tannins, good concentration and notes of dark chocolate, licorice spice and a dried fruit finish. This is a classic Alexander Valley Cabernet offering layers of crème de cassis, black cherry, olive tapenade, violets and moist earth. On the palate, lush dark berry flavors are balanced by firm tannins and an inviting freshness while more savory and herbal hints add complexity and depth. a wonderful composition of peach, pear and orange citrus. Beautiful straw gold with a medium body and a touch of sweetness. Fresh melon meets tangerine with a finish of Asian pear and crisp Granny Smith apple! A great wine for casual drinking, yet can be enjoyed with food, especially with something slightly spicy. Rich and fragrant, Grand Reserve Malbec envelops an exquisite bouquet of sweet and spicy plum, blossoms in the glass to reveal notes of tea leaves and cassis, moderate tannins and finishes with an understated-yet-resonant oak. Seems young and tight when first opened, but gains weight with air. Nice core of dark red and blue fruit with some herbs de Provence. Clean palate with long finish. Decanting will increase the enjoyment of this wine. This Portuguese white wine is dry, rich and complex. It starts with fresh apple and pear notes that coat the mouth. Long contact with the skins gives this wine impressive structure and surprising tangy tannins. Like most Vinho Verdes, this is a great wine to enjoy in its youth, but this is also one that will improve with age. One of the Cru Beaujolais, Morgon offers richer fruit flavors, fuller body and firmed structure than what you might expect from a regional Beaujolais and certainly a Beaujolais Nouveau. Bright garnet in color with cherry, kirsch and strawberry flavors this lush wine has a silky, round mouthfeel. Substantial tannins and fresh acidity ensure that this is a wine that will evolve with time. Bright ruby color fading to rusty highlights, this Tempranillo offers classic red fruit flavors paired with aging notes of vanilla, spice and dried herbs. The tannins are fine, but firm and a tart acidity keeps this wine feeling lively long into the peppery finish. The Raboso grape is a high tannin, high acid grape that is typically used in the blends of Northern Italy, but is occasionally made into 100% varietal wines such as this one. With a small portion of the grapes dried “passito style” before pressing, this wine offers rich red currant, blackberry and plum jam notes. The palate is full bodied with earthy notes of licorice, spice and dried herbs developing on the finish. Come try some great wines to pair with your Thanksgiving dinner! A blend of the Alsacian Noble Grapes: Muscat, Riesling and Pinot Gris, this delicate yellow wine presents an intoxicating nose of lychee, pineapple and papaya. The palate mirrors the fruit in the nose with additional notes of fresh grass and wet stone. The palate is light and lively with a dynamic acidity that lingers into a spicy finish. This wine is an excellent representation of a classic Sonoma Pinot Noir. The nose is rich and intense with notes of black cherry, elderberry and dried rose petals. The palate is lush and juicy with flavors of cherry cola and dark earth undertones. French oak aging adds underlying hints of vanilla and toffee. Delicious and quaffable! Cotes du Rhone are blends traditionally focused on the Grenache grape. E Guigal has produced their version with a focus on Syrah, producing a wine that is more intense and structured than its counterparts. A melange of dark fruit flavors is accompanied by savory, earthy notes of black olives, smoke and pepper. One of the most recognizable Cote du Rhones on this market, this wine also represents one of the most outstanding values. Chateau Montelena may be best recognized for their classic Napa Cab and Chardonnay, but when they turn their hands to Zinfandel, the results are truly stupendous. A mix of Primitivo and Old Vine Zinfandel, you get and impressively complex and Old World style wine. Aromas of dried cherry, cocoa and dried lavender guide you into a palate that is silky and supple. Fresh cranberry dominates the fore-palate with roasted walnut and clove spice evolving. The finish is clean and mineral driven with earthy flavors of cigar box and dried herbs. Delicious!